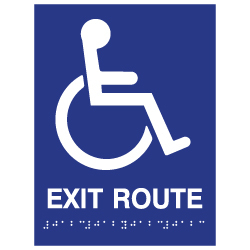 An ADA Compliant Accessible Symbol Exit Route Sign with Text and Grade 2 Braille from STOPSignsAndMore.com will always pass ADA inspection. Our ADA Compliant Signs are high-quality and professionally manufactured. Unlike many imported ADA signs, our Made-in-America ADA signs meet ADA regulations and will pass official Americans With Disabilities building inspections.